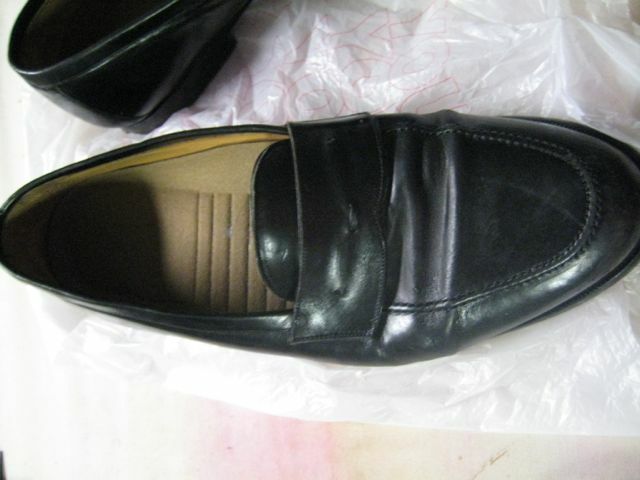 Sometimes, in theater, you need a specific period shoe and you don’t have the time to order it from the internet, the money to order it from the internet, or an actor who wears a size you can order from the internet. (In this case, it was an “all of the above” scenario – I had a Benjamin Franklin who wore something like a 13EEE. This is hard enough to find in a modern shoe at community theater prices. As for replicas, you can forget it!) This is not a demo that will show you how to make an exact replica. It’s more of an act of desperation, which might possibly inspire others to do a better job than I did. ;) I just needed something good enough for stage at the “this ain’t broadway, sweetheart” level. I feel the need to, one more time, point out that I never used to believe that there were user-serviceable parts inside of a shoe. Turns out, there are. Hack off the ridiculous fringy-poo and tassel action. 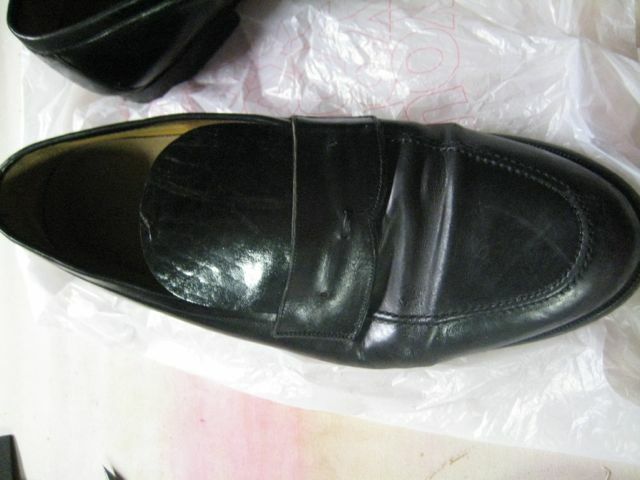 Cut a new tongue for the shoe out of matching leather. 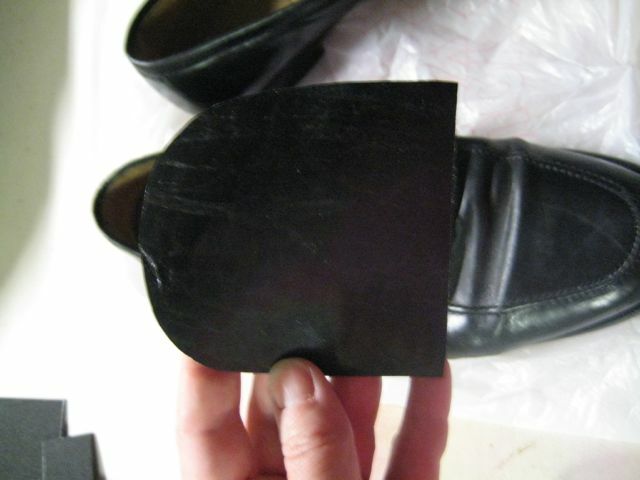 The base should be as wide as the front opening of the shoe, and it should be long enough to touch the ankle plus an inch. Glue the new tongue in between the existing tongue and the band that used to have the fringe on. 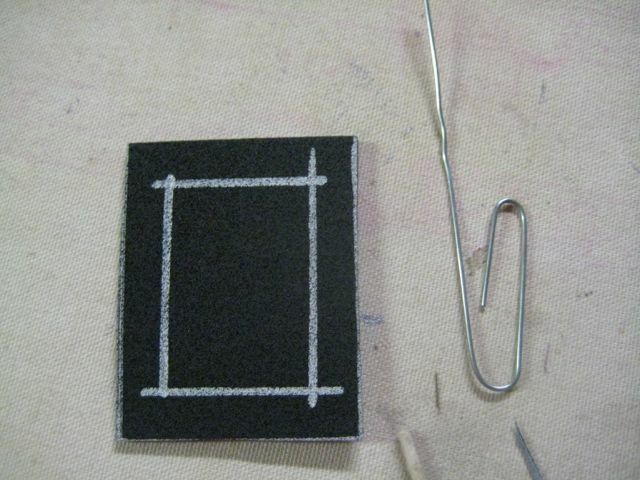 I'd normally recommend Tanner's Bond for something like this, but I was out and used a generic rubber cement product. As we all know, the shortest distance between here and Colonialandia is a great big metal shoe buckle. People sort of expect them. The problem is, companies that make them know they’re obligatory bits for colonial costumes, so once again, we’re stuck at “more than I want to spend”. Also, I didn’t order in time. Ahem. Well, you know, a girl gets kinda busy with a show and, um, the cat doesn’t know how to use the internet. File under Good To Know: silver sharpies mark craft foam better than any other marking solution on the planet. 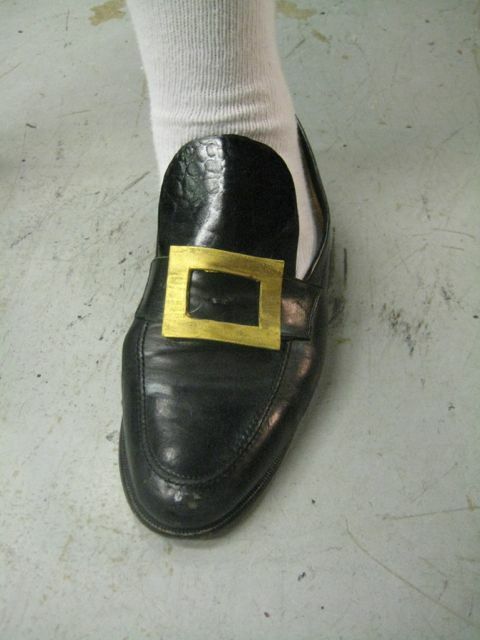 I cut out the center of the “buckle”, painted the darn thing gold, and hot glued it onto the shoe. Yes, I said it: I hot glued it onto the shoe. My magic wand was out for repairs. My sewing mice were on strike. I was out of milk for the late-night cobbling elves. I just plain ran out of clever. It happens, you know? Hot glue is valid, if you don’t mind chasing down actors with a glue gun in hand periodically. The finished shoe, in all its cheesetastic glory. 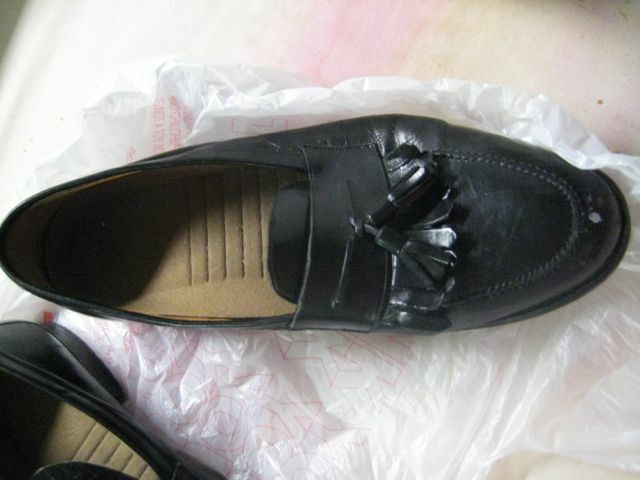 The heel is all wrong, mind, as is the toe box and the stitching around the top edge, but you know what? It looked just fine on stage. Also, any guy in any shoe automagically looks more colonial in white socks and knee britches. Extra points if you can avoid using baseball socks….